OK, remember how yesterday I talked about keeping my legs extended in between the second to last and last set of the cable leg press because I heard you got a great pump? Well, lemme advise against that now. Before I went to bed, I noticed my lower back hurting. The kinda hurt you feel when you’ve been laying down too long. It was pretty sensitive when I woke up, and I think that was caused by the static hold that I did. When I read about this idea, it was talking about doing it with a Hack Squat, which I think would be a hell of a lot better. So, learn from my mistakes, it’s what your boy Caliber is here for. The first compound sets are done in the style of the 5/3/1 program, with the weight based on a percentage of my max lift. I usually rest 2-3 minutes when things get heavy. With the following compound hypertrophy based lifts, they’re done at 50% of my max, and I rest at the absolute most 60 seconds. That much volume with such little rest gives you a great pump and wears you out pretty well. The following sets that are 3 sets of 8 I only rest 30 seconds for, and just look to burn things out. I’m really digging the hell outta this 5/3/1 template. Today I hit another rep PR, when I snagged 6 reps at 155. I have a goal of 200lbs at the moment for a single, and think I’m pretty damn close with it. I’m really trying to bring up my chest, with a lot more focus on incline. If I go too heavy on Incline for too high of reps, I really start to feel it in my shoulder. However, at this weight, I can really focus on working the chest, and can keep my rest periods to 60seconds, max. Love this machine. I can make a weight where I can bust out 10 reps for 5 sets, but I still get to use the stabilizer muscles and such. I normally do a standard fly movement, but today was the first time I’ve done the old school crossover. Where the cables are set high, and i bend a bit at the waist and pulldown. Like what you see Arnold do in Pumping Iron. Loved the hell out of it. This is a super old-school movement that absolutely no one does anymore. All the cats from the 70s and 80s had super-thick chests, and I believe this was a big reason behind it. I love the stretch you get. So, I did each set here back to back, then rest for about 30 seconds before doing the next circuit. Standing Shoulder Lateral Raises – 15xTF, 10xTF, 5xTF for 3 sets. I would actually get close to failure, but not exact. I also mixed up the various ways I did this lift, like twisting the hand at the top, bring the dumbbells in front of me, that kinda stuff. Great burn. 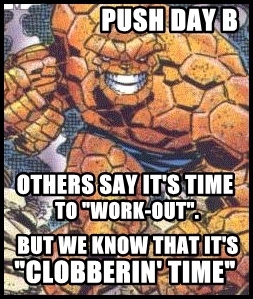 Previous PostCaliber’s Powerbuilding Workout Spectacular – Day 8 – Leg Day 8Next PostHulk Smash, baby.